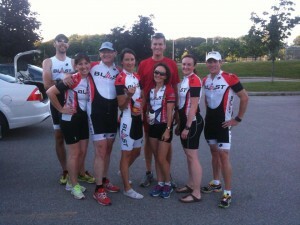 The BLAST Triathlon Club enjoys a rich history in the sport of triathlon. Our club started off more than 20 years ago and was renamed Blast Triathlon club just over 10 years ago. During these years, our athletes have successfully met or exceeded their own goals. Some of our athletes have competed in their first try-a- tri while others have gone on to compete in 70.3 events, Ironman events and even at World Triathlon Championship events. Our club accepts all levels of experience and ability and contains adult athletes of all ages. “Blast” is a club that works hard during training but also recognizes the importance of having fun. The club meets every Thursday evening at 5:45 pm for a running workout at various locations in the West Hamilton, Dundas and Ancaster area. In the summer months we combine bike and run workouts. We are just finishing off our Fall swim sessions and are now in the planning stages for our Winter swim session. Those are expected to begin in January 2018. In addition to swimming, we are also looking to add spinning classes in January as well as several “Yoga for Triathletes” classes. Stay tuned for more updates ! Meet some fellow Blast members!